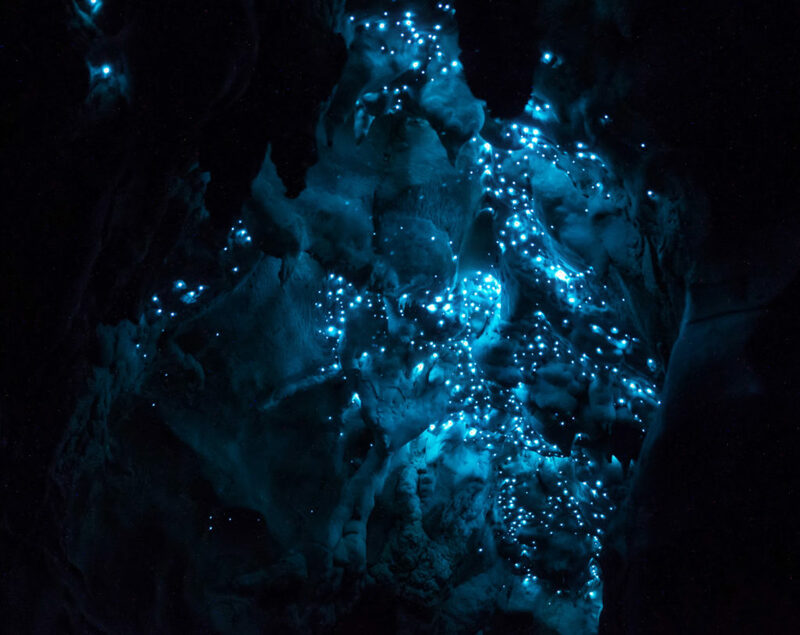 [Image: Glow worms inside Waitomo Cave; photo by Jason Roehrig, via KQED]. Carnivorous glow worms catch their prey “by mimicking the night sky,” KQED reports. Think of it as a surrogate astronomy enacted to disorient other species, leading to their deaths—a predatory planetarium of creatures acting like someone else’s stars. “The strategy is simple,” KQED explain. “Many of these insects, including moths, navigate by starlight. They keep the celestial bodies at a constant angle to fly in a straight line. ‘That works fine when the moon and stars are real,’ said Dave Merritt, a biologist at the University of Queensland in Brisbane, Australia, ‘but when the source is close they end up spiraling into it.’” When the moon and stars are real! What a peculiar existential position to be in, needing to determine whether the night sky itself is—or is not—a decoy meant to lure and trap you. Read more over at KQED. (Vaguely related: The Bioluminescent Metropolis).